Computer Troubleshooters, the world’s largest computer service franchise, has created this Charity Service Program to provide discounted or donated computer services to qualified non-profits and charitable organizations. We believe by sharing our skills and abilities within our local areas we can do our part to improve our communities. Each participating Computer Troubleshooters location sets aside a certain number of service hours per month for donated or discounted computer services for qualified local charities. To find out more about our services, please contact us by filling theService Request Form at the bottom of this page. If you are involved with a non-profit or charity, we understand that you have to carefully watch every cent of your organization’s expenditure. CTS Team is proud to support your efforts and provides discounted or donated computer charity services to qualified non-profits and charitable organizations. As we believe in sharing our skills and abilities to improve local communities, our franchisees set aside a certain number of hours per month to service their favorite non-profit organization or charity. 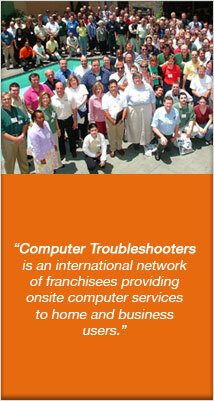 Please visit http://www.computertroubleshooters.org to learn more. If you are a qualified non-profit organization or charity, please contact the CTS Team and ask to be included in their available charitable discounted/donated service hours.